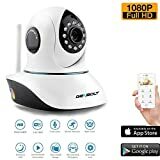 HI-PERFORMANCE & EASY SONIC SET UP – GENBOLT Wireless WiFi Security Camera adapt newest 1080P chipsets from OmniVision.Plug & Play featuring One-Key Wifi Configuration which allow you to setup within 1min,say Good-Bye to complicated settings. HI QUALITY TWO-WAY AUDIO – Built-in microphone and speaker ,not only can see what is happening in your house,but also you can hear and speak.As a good dog camera ,you can tell to stop your dog get away from chicken on desk when you are at office. 24/7 VIDEO RECORDING AND MOTION DETECTION – GENBOLT Network Surveillance IP camera max support 128GB SD Card with intelligent recording to save more space.You can choose 24/7 or only record after triggered via app.Once alarm has triggered, a instant email or notification will be sent even you are thousand miles far away. SUPER WIDE VIEW ANGLE – As a good nanny camera,it support Horizontal angle 355°and vertical angle 120°offers you a full view of any occasions.Wireless Remote Pan Tilt Control via fingertips’ sliding on sereen,Night Vision Up to 30 feet. AUTO DAY NIGHT VISION – The built-in auto IR-CUT filter provide clear image with true color display.Multiple preset position function help you define the position when specific event occurs or trigger.This Baby Monitor Support Android/iOS/Mac/PC. is one of the most desired brand in North America,Europe & Asia,used in home security,school,office…etc. This Wi-Fi HD pan tilt Home IP camera offers extra wide, whole-room surveillance coverage with 355° horizontal pan (left & right) ,120° vertical tilt (up & down)by finger swiping on screen. Presets function : camera automatically move along a desirable route to allow users to easily capture a number of specific points around a room to ensure that the most sensitive areas are covered. Wifi Camera starts recording a short video(if SD card inside) & send notifications(or email) to your phone when there is motion detection (keep APP running at device background). Can carry 128GB SD card(NOT included ,need format into FAT32 before recording) which is biggest in the market.Review the footage from the past easily. Download “EYE4” or “EYECLOUD” at Apple Store / Google Play.Remote pan tilt control,snapshots,video record, two-way talk. 1,connect device to a 2.4G WIFI before setup. 2,power camera & wait it speak”wireless configuration is waiting”. (push reset button at backside of camera for 10secs if not heard). 4,no more clicks & wait until button”Binding”show up. 5,login default password 888888 for iOS(Android no need). b,push reset button at backside of camera for over 10seconds. c,wait until camera speak “wireless configuration is waiting”. d,repeat Sonic Set Up(choose “Quick Setup”). This entry was posted in Discount Photography and tagged 1080p, 2.0MP, Audio, Camera, CameraBaby, Card, MonitorTwoWay, Nanny, Network, Night, Security, Slot128GB, Surveillance, Tilt, Vision, WebcamDay, WiFi, Wireless by Ball Photo. Bookmark the permalink.